So, yesterday I finished writing The Disappearance of Winter's Daughter (Book 4: The Riyria Chronicles). But that still means it's far, far from done. Here is the schedule I'm going to try to stick to in order to get the book from "written" to "released." This is, of course, a tentative schedule, but we need something to be working toward so people can plan appropriately. Marc Simonetti has already started on the cover design (part of which you can see above). And Tim Gerard Reynolds and the studio are already booked for the dates listed above. If you are excited about the book here are some links that may interest you. Sign-up to become a beta reader. Pre-order audio copy (and get free ebook edition). If you are interested in ebooks or print editions, an early-notification sign-up is here. If you think you might want to be a beta reader, you need to read this "Primer" first as it explains how the beta is conducted and what will be expected of you. In any case, still a lot to get done in a short amount of time, but I think the novel is in good shape so hopefully everything will come together quickly. 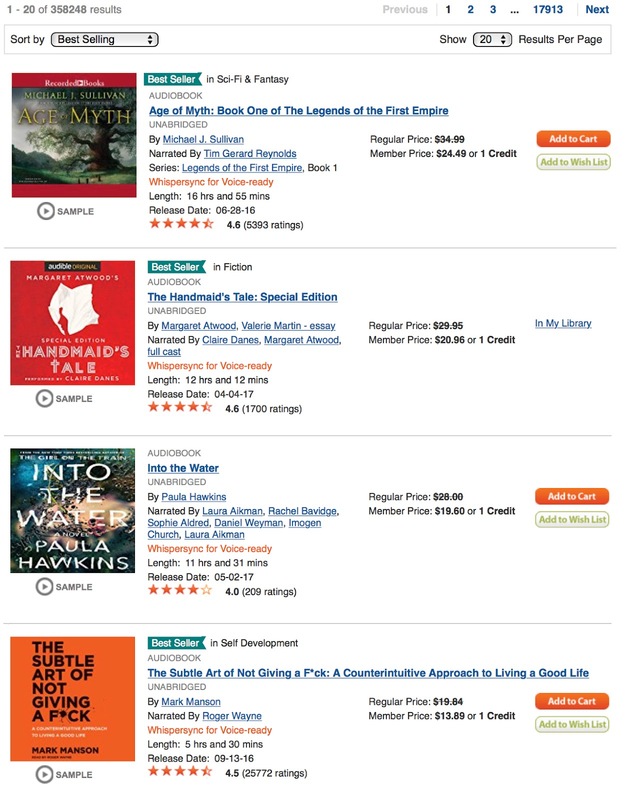 I love audio books, and Audible's 2 for 1 sale is always a great opportunity to pick up a few extra listens. From now until May 22 (11:59 PT) these are the audio titles in the fantasy category on the 2 for 1 sale. 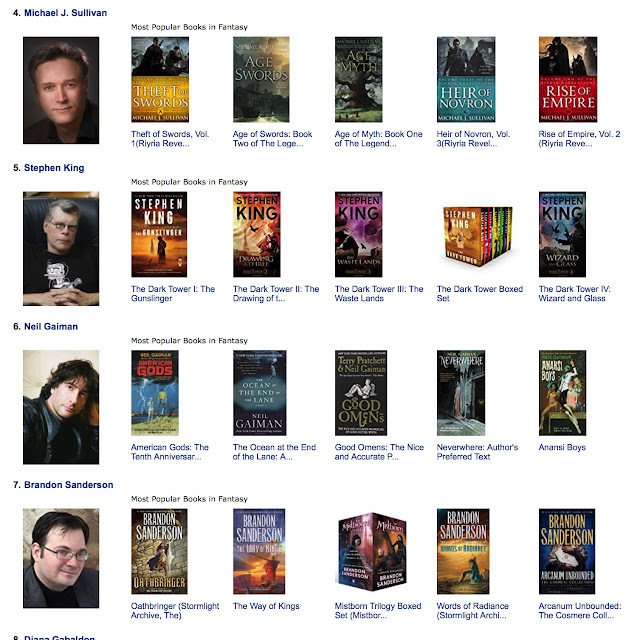 There's been movement on the best-selling epic fantasy for upcoming epic fantasy novels. Pleased to be sharing the top spots with Brandon Sanderson and Peter V. Brett. Keep those pre-orders coming in, and as always I thank you for your support. My thanks to everyone who picked up Age of Myth while it was on sale on Saturday. 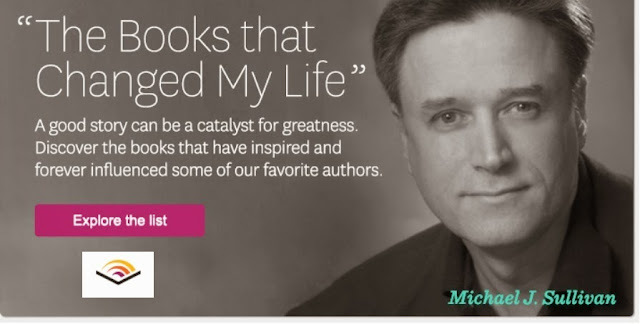 I'm pleased to announce that your support made it the #1 Audible Bestseller! Kind of a good feeling being number 1 out of 358,248 books! Usually I'm ranked in the 30's or 40's, which is definitely something to be proud of. Still, it's fun to swim around with the biggest fishes in the business, even if it is only temporary. In other news, work on The Disappearance of Winter's Daughter continue to go well. Just a few chapters left to go! I'm pleased to announce that for today only, you can get a copy of the audible version of Age of Myth at a special discounted price. 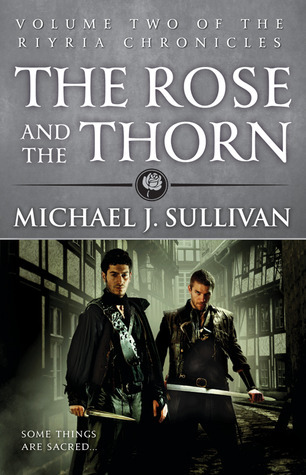 This is an excellent opportunity (and great timing as the second book, Age of Swords, will be coming out in just a few months). How deeply discounted? Well, you can get it for just $5.95. That's more than 75% of the regular price and 83% off the member price. Even better...if you've not heard one of my stories read by the amazing Tim Gerard Reynolds, then you're in for a real treat. Tim makes me sound so much better than I really am, and you shouldn't miss his performance. And if that isn't enough to convince you, to pick it up today, then maybe the opinions of people who have already listened to it will help. 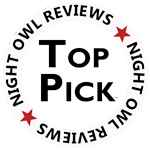 The audio version is rated at 4.6 with more than 5,300 reviews or ratings...and 5,000+ of those have given it 4- or 5-stars. The only catch is you'll have to hurry, the sale price will vanish at 11:59 PT. I hope you'll give the book a try, and if you do, I hope you enjoy the listen! 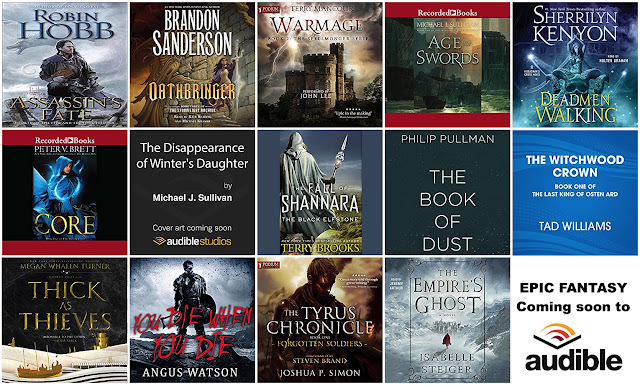 Brandon Sanderson, Robin Hobb, Terry Brooks, Peter V. Brett, and even little ole me have some books coming out soon, and if you have a few spare audio credits, you might just want to put one of these on pre-order. 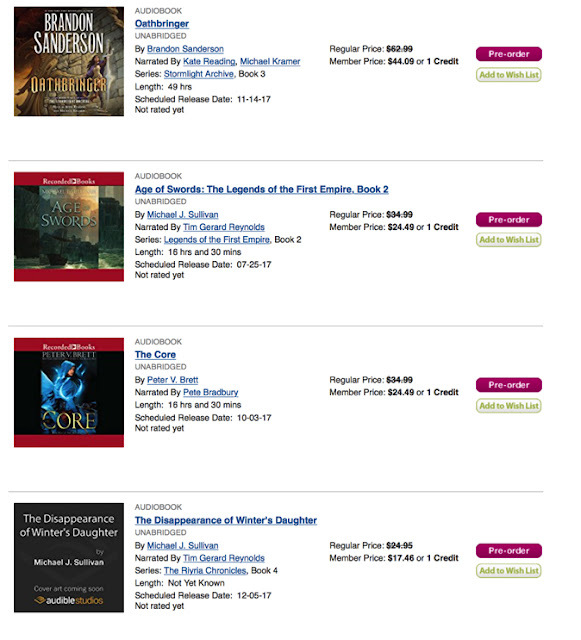 Out of the 14 Epic Fantasy titles coming soon, I'm pleased that mine are hitting at #4 an #7 when sorted by best sellers. Here's the complete list, along with links if you want to learn more about any of the titles.